When it comes to hyperconverged deployments, Lenovo offers flexibility so that customers can choose the model that best suits their business needs. 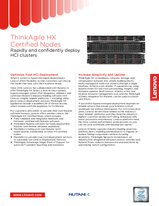 Since 2014, Lenovo has collaborated with Nutanix to offer ThinkAgile HX Series, a best-in-class turnkey hyperconverged system that integrates, validates, and optimizes Nutanix’s industry-leading software with Lenovo';s highly reliable platforms — including white-glove Lenovo deployment services. ThinkAgile HX appliances include a bundled Life of Device license, which remains with the appliance for its lifetime. ThinkAgile HX consolidates compute, storage, and virtualization software into simple building blocks, easily managed in scale-out clusters through a single interface. Achieve even simpler IT operations by using Nutanix Prism for one-click provisioning, insights, and firmware updates. Both Lenovo XClarity, a fast and intuitive resource management tool, and the ThinkAgile XClarity Integrator for Nutanix, can be used in concert with Prism. Lenovo XClarity captures industry-leading proactive platform alerts, enabling administrators to migrate or replace failing components without incurring downtime. ThinkAgile Network Orchestrator, an industry-first integration between Lenovo switches and Nutanix Prism, reduces human error and downtime by automating switch configuration. With ThinkAgile HX Certified Nodes, you have the freedom to bring your own Nutanix term-based licenses while leveraging outstanding Lenovo reliability and performance, Nutanix simplicity, plus Lenovo ThinkAgile Advantage for seamless life cycle management. Deploy your HCI clusters rapidly and confidently with Lenovo. The 1U 1-node ThinkAgile HX 1001 Certified Nodes are engineered for light-to-medium workloads (business applications and VDI), optimized for remote office/branch office (ROBO) environments. ThinkAgile HX2001 Certified Nodes are optimized for small and midsized businesses (SMB). Available in a 1U form factor, they are ideal for virtualized file, print, email, and other office applications. ThinkAgile HX 3001 Certified Nodes are available in 1U 1-node, 2U 1-node, and 2U 4-node form factors. All HX 3001 Certified Nodes are engineered for compute-heavy workloads (business applications and VDI) and offer rack-dense, all-flash (-F) and GPU (-G) models. The 2U 1-node ThinkAgile HX 5001 Certified Nodes are engineered for storage-heavy workloads (Big Data and enterprise applications) and offer a high-capacity model. The 2U 1-node ThinkAgile HX 7001 Certified Nodes are engineered for high-performance and mission-critical workloads (enterprise applications and in-memory databases, such as SAP HANA) and optimized for I/O intensive operation. Drive Bays 12x or 14x 3.5" 24x 2.5" Up to 24x 2.5"
ThinkAgile Advantage, in available countries, provides a first-class support experience to make the most of your ThinkAgile products and solutions. You will skip the wait and connect directly with skilled technicians through your own dedicated phone line, for real-time triaging and troubleshooting. As a single point of contact, your dedicated Lenovo specialist will own your support case end-to-end, ensuring a faster and more seamless resolution. † ITIC 2018 Global Server Reliability Update. ǂ TBR x86-based Servers Report. * Visit Lenovo Servers World-Record Performance Benchmarks for more information. ** Microsoft Hyper-V 2016 support available in the first half of 2019. Document number DS0046, published June 26, 2018. For the latest version, go to lenovopress.com/ds0046.